Ghananie.Com: President's Whereabouts Revealed At Last! 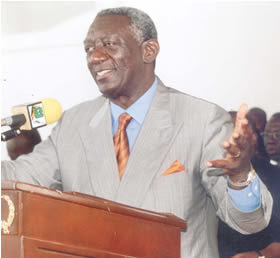 Members of parliament from Ghana's opposition National Democratic Congress (NDC) party are citing President John Kufuor for contempt of parliament for failing to explain to both parliament and to Ghanaians his whereabouts with his widely publicized, but aborted foreign trip. The NDC claims came after a persistent refusal by the president's office to explain his whereabouts, especially as the country faces floods that threaten a loss of lives and property. The NDC concludes that President Kufuor has not only deceived parliament, but also imperiled the people of Ghana. From the capital Accra opposition Member of Parliament Haruna Iddrisu tells reporter Peter Clottey that President Kufuor did not adhere to the country's constitution. "Ghana is governed by the constitution, and article 59 of the constitution imposes an obligation on the president of Ghana. The president is mandated to notify the speaker of parliament in writing when he wants to leave the country. Under the standing orders of parliament, any misleading information is contemptible. What we are aware off, the president never went to Canada, yet no official explanation has been given as to his whereabouts between the periods that he should have been in Canada, and to the extend that no official explanation have been given, and his whereabouts is unknown. We only can conclude strongly that he deceived parliament, and he deceived the people of Ghana, and that to me is contemptible," Iddrisu pointed out. Iddrisu agreed that although there is a possibility of the president's plan suddenly changing, he is obligated by law to explain his whereabouts. "Yes, but he owes Ghanaians a duty and the standard of care in explaining his whereabouts. To the extend that he does not explain where he was, I think that one would want to cite him for contempt for giving misleading information to the speaker of parliament and to the people of Ghana," he said. Iddrisu said the opposition party would know its next line of action to take when the president or his officials fail to respond to their request. "Our constitution is clear on it (going against the constitution), we are for now demanding an official explanation from him and from his spokes people. If he refuses, then we would know the next line of action. But we are clear in our minds that his conduct is in contempt, and a breach of the privilege of parliament," Iddrisu noted. Meanwhile, the government has dismissed the opposition's claim as unfounded and misleading. From the capital Accra, Ghana's deputy minister for information Frank Agyekum tells reporter Peter Clottey the president's whereabouts are not clandestine. "It is true that the was an announcement that the president was supposed to go to Canada and then onwards to the UN. But what happened was that, at the last minute the trip to Canada was aborted because he was supposed to sign an agreement with the Alkan group of companies. But the MOU (memorandum of understanding) to that wasn't finished before he set out for the trip. So when it came to his notice we thought it wasn't worth it having to do the trip anymore. The president then was in the UK in London and he took the opportunity then instead of coming back home to tie up a few things and then move on to the UN because he was supposed to address the UN," he said. Agyekum agreed that the presidency should have come out with a statement to explain the president's whereabouts, but he denies the president's whereabouts have been shrouded in secrecy. "Yes, perhaps a statement should have been issued immediately to explain the circumstances and we regret that, that wasn't done. But that was not because the president was trying to hide anything or anything clandestine was taking place. It's just that well, in this world sometimes tings do not work the way you want them to, but that is the explanation,"" Agyekum noted.